I have mentioned David Striker before. There are several people I know who are currently undertaking the mildly arduous task of visiting every medieval church in Norfolk and Suffolk, but David is the only one of them who lives in Colorado in the USA. But he used to live in Brandon, and when he told me he was coming over here for a couple of weeks and suggested a road trip, I wondered if we might pick off the churches which run up through the south-west of Norfolk from Brandon to Downham Market. 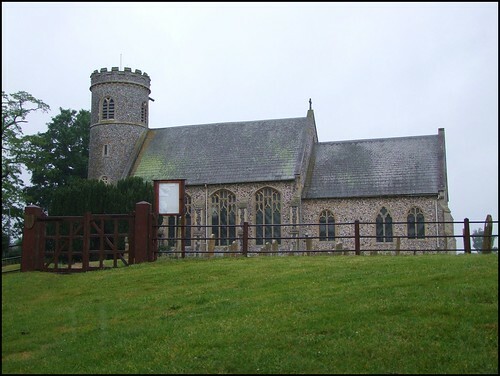 The most southerly of these churches are ones which David knew well, and, although this is by no means Norfolk's friendliest area (it is, after all, in the Ely Diocese) we were expecting a fair number of open churches, particularly this one. The parish of Weeting adjoins the Suffolk border - indeed, some Weetingers live in the northern part of the Suffolk town of Brandon, which spills into Norfolk. Brandon Catholic Church and Brandon railway station are both in the parish of Weeting. But the medieval parish church is near the village of Weeting, a couple of miles to the north. It was soon after nine o'clock, and we headed out of Suffolk and up the busy road. It's worth pausing for a moment to wonder why a Church of England parish might keep its building open during the day. What's in it for them? Catholic churches, for example, have a liturgical imperative to be open - the Blessed Sacrament is reserved, and it is seen as a duty of the faithful to go in and pray in its presence if they are passing. Most Anglican churches don't do this (although a few do) and in any case, anyone insisting on praying in the Presence of the Sacrament in an Anglican church might well be frowned upon as an enthusiastic and not altogether harmless eccentric. However, over the last few years, the Church of England seems to have begun to see its mission in a new light. Rather than succumb to depression at the possibility of terminal decline, it has increasingly repositioned itself as being there for all the people of God rather than just for the Sunday club. At parish level, this means that the church needs to be available for anyone who is passing, a pilgrim or a stranger, who wants to go in and pray, or grieve, or merely experience a sense of the numinous. This is particularly important for rural churches with a graveyard which is still in use, because it enables visitors to family graves to visit the church as well, and say a prayer or two if they want. If the church is locked, then visiting a grave becomes divorced from the experience of Faith. It becomes a secular activity - or, even worse, a Pagan one, visitors merely worshipping their ancestors with propitiatory flowers. It may well be that, these days, regular users of a parish church never attend a Sunday service at all. I've met several people on my travels who often pop into the building just to sit for a while, but don't ever go to a service. In a funny way, it makes me rather optimistic - they may not have a sense of ownership, but they do have a sense of belonging, and because of this the Church of England may outlive its predicted demise. The great majority of Norfolk's medieval churches are open all day, every day, of course, and the Diocese of Norwich enthusiastically encourages and supports this. Things get a bit stickier in that part of Norfolk under the rule of the Diocese of Ely. It may be that Ely doesn't have the same mission for its parish churches, or it might just be that they are reluctant to press the point with these parishes beyond the Cambridgeshire pride lands, but it remains that there are many more locked churches in this part of Norfolk than any other. Of course, some of these locked churches have a notice telling you where to get the key, but not all of them do. However, David remembered finding Weeting church open on several occasions, and so did several other church explorers I'd asked. We came up from the village centre along a rutted track. It was absolutely pouring with rain - it had been since David picked me up at Bury station, and the sky was leaden and heavy. It was not an auspicious start. It was certainly not possible to get out and photograph the outside of the church: I wound down the car window, and took the shot at the top of this page. As you can see, this is a round-towered church, but a rather crisply-lined one. The tower dates only from 1868, when the old one was demolished as a danger. The nave and chancel are older, but the flint work appears to have been almost completely redone at about the same date. I put my camera under my coat, and we set off to take a look inside. I saw the padlock as soon as I got out of the car. The outer gates of the porch were bound by a big chain, and with a heavy heart I trudged up the long path to see if there was a keyholder notice. There wasn't. Despite the weather, I was feeling charitable. Many rural Anglicans are elderly; this church is away from its village centre, and it did not seem unreasonable to think that the person responsible for unlocking it had looked out of the window, assumed that no one in their right mind would be out church-visiting in this weather, and had decided to wait for the rain to stop before going up to open the church. This, however, did not help us much. We staggered back through the rain, slipping on the wet grass. On the edge of the graveyard was a noticeboard. There wasn't a keyholder notice, but there was one of those in case of emergency notices which parishes have been browbeaten into putting up. I found the churchwarden's number and rang it. He wasn't terribly pleased to hear from me. "We keep the church locked. We don't encourage visitors. We've had lots of trouble. Lots of things nicked, lots of damage." He had a strong accent, a reminder that it is still ordinary local people who keep the Church of England going, not the pen-pushers in Diocesan House. I explained who I was, and about the Norfolk Churches Site, and David having come all the way from Colorado. He thought for a moment. "I can't come and open up, it's not convenient. I don't drive, I'm a retired merchant seaman." At this point, a little chink of light appeared in my mind. I'm always impressed by people who don't drive - I'm one myself, and there is something a little bit different about us. And all retired merchant seamen I've ever met have been eccentrics, and eccentrics rarely have closed minds. I wondered if anyone else would come and open up for us. "No, I don't want to put anyone else to any bother in the rain. Who did you say you were? Have you got any money?" I laughed, and said no, and he laughed too, and gave in. I suspect that he had heard the voice of the Ely Diocesan Tourism Officer nagging in the back of his head, reminding him of his duties as a churchwarden. "If you come down now, I'll come back with you and open up". It always feels good to be trusted by a stranger, and so we went back down into the village with light hearts to get him. He had that determined energy you so often find in ex-servicemen. "I can't understand how anyone can leave a church open to the public, I never would" he told us, as he got in David's car. We headed up to the church. "You wait in the porch", he said,"I'll turn off all the alarms". He came back out to get us. "We're smart-watered up to the eye balls" he said, as he let us in, just in case, after all this, we still decided to pick up a pew and run with it. It turned out that there had been a fair amount of petty vandalism, but the final straw had come when an old altar frontal, woven by a long-dead but fondly-remembered member of the congregation, had offensive slogans scrawled on it in biro. This was shocking - sacrilege is not the kind of thing which happens in East Anglia very often. He had only been in the post a year or so, but he had decided that the church had to stay locked from now on. This was sad, but it seemed to me that a small parish community like this must often feel a sense of helplessness when faced with the responsibility of caring for a sacred space in the face of an attack. The protection of property is not a Gospel value, but these buildings are time capsules and touchstones which hold the very soul of their parishes, and they need to be preserved if at all possible. Sometimes, it must seem that locking everybody out is the only way of accomplishing this. Vandalism of a church strikes at the very heart of the whole local community, but the response to it can also have a deleterious effect. The church is pretty much all Victorian inside, with a good 1905 east window. It depicts the Ascension, and is by George Parlby, probably his only work in East Anglia. It would be fair to say that it dominates the church, but this is not necessarily a bad thing, for the place would be rather characterless without it. There are image niches either side of the window, which I first took to be a Victorian pretence, but on closer inspection they are exactly the same size as the creed boards now in the north aisle. These date from the early 19th Century, and were almost certainly designed to cover the niches by protestant-minded churchwardens of the time. Possibly, they replaced earlier ones pressed into the same job. The Decalogue is on a reredos, now also in the north aisle, but which would once have been in the sanctuary. They were probably removed in the 1890s, when the current carved wooden altar and reredos were installed. These are not particularly exciting, but are interesting because they were the work of the Rector's wife. There are several East Anglian churches where the wife of the incumbent took on restoration work, a fascinating insight into the mind of the times. We spent about twenty minutes chatting with our new friend, and poking about his church. And then, something rather extraordinary happened. It seemed that the parish's seventeenth century silver was en route to its usual home in the treasury at Ely - it had been shown at an exhibition, and was currently in the care of the parish. It was due to be picked up later that day, but while it was still here, would we be interested in taking a look? We certainly would. The churchwarden carefully unpacked it, and set it out on the table. It consists of a paten, which is the round silver plate used at communion, two chalices for the wine, and a smaller plate which I took to be a sub-paten, usually a sign of a sacramentally-minded congregation. I think that only the paten is 17th Century, but it has a fascinating inscription on it, Ecclesia Weeting Maria Sancta Beatae ex dono Judithae Wright 1674: 'The church of Blessed Saint Mary at Weeting, given by Judith Wright, 1674'. 1674 is a pivotal date in English church history. It is 14 years after the Restoration of the monarchy and Church of England, after the long puritan darkness of the Commonwealth, but it is also shortly before the so-called Glorious Revolution, when a coup led by the London merchant classes brought down the Catholic King James II and replaced him with the arch-Protestant Dutch prince William of Orange, who became William III. The Act of Supremacy which accompanied this coup ensured that the English Crown and the Anglican Church would remain Protestant, pretty much forever. This time is a fever of ideas, when the Church at a parish level was trying to reposition itself after decades of non-conformist anarchy. We got out the parish registers, and found Judith Wright's name. She had married here in the late 1640s, when 'the world turned upside down', but less than thirty years later she was donating sacramental vessels with a Latin inscription refering to the patron of the church as Blessed, in the Catholic manner. It was fascinating, and I was glad we'd seen them before they were locked away in a safe in Ely again. We pottered about a bit more. Beneath the north window in the north aisle chapel is another curiosity, two simple piscinas sunk into the sill, side by side. They would have served an altar here in Medieval days. But why two, I wondered? Another fascinating detail is the WWI cross at the west end of the south aisle. These were set originally on the graves of soldiers killed during the fighting, to be replaced after the war by marble headstones provided by the Empire War Graves Commission. Families could apply to have the temporary wooden cross sent back to Britain, and many did. This one, unusually, has a Latin inscription on it, aucto splendore resurgam, 'but he shall rise again in great splendor'. The inscription continues In Memory of 11648 Sgt V Malt MM, 7th KSLI, Killed in Action Aug 21st 1918. Victor Malt was a Sergeant in the Seventh King's Shropshire Light Infantry. He was the son of a Mr and Mrs H. Malt of Weeting, and the husband of Beatrice Emma Malt, of 9, Thetford Road, Brandon. When he died, he was 28 years old. He is buried in Bucquoy Road Cememtery, Ficheux, near Arras. On the other side of the tower arch is a grandiose monument in a mock-18th century style. It remembers John Richard Julius Angerstein, who died at Holbrook in Somerset in 1925. He is remembered by his widow Georgiana, whose own death date of 1945 is noted at the bottom. John Richard Julius was the last of the Angersteins of Weeting Hall. The Angersteins were a Russian family, from St Petersburg, arriving in Norfolk in 1749. The first of them, who anglicised his name to John Julius Angerstein, was a fabulously wealthy merchant. White's 1845 Norfolk Directory notes that he became a celebrated and wealthy stock broker and underwriter at Lloyds. He planted here upwards of 1000 acres, was a distinguished patron and connoisseur of ancient and modern art, and was the first proposer of State Lotteries in England. He resided chiefly in Pall Mall, and at the Woodlands on Black Heath. He died in 1823, and his valuable collection of paintings were purchased for the National Gallery, at the cost of nearly £60,000 - which is to say, roughly twelve million pounds in today's money. The Angersteins have gone, and Weeting Hall, their Norfolk pile, was demolished in 1954.